We've got some more interviews from the ASL Open. We visit with Jim Burris, the host of the St. Louis ASL Tournament. It is a great tournament that you won't want to miss. So head on over and visit the "Gateway to the West". If that's is not enough for you, we have a discussion with John Lehman, member of the SoCal ASL group. Hearing from one of our West Coast brethren is quite an honor. During the letters segment we reveal the winners of the "Suggest a Contest" Contest. Listen all the way through 24:40 to discover whether or not you are one of the chosen ones. 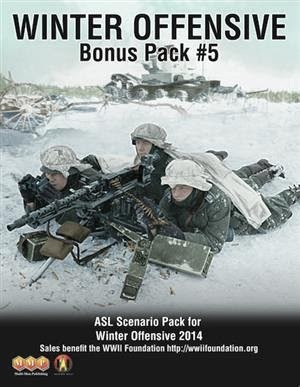 If you are wondering just what is in Winter Offensive Pack #5, we have the answer for you right here. Just hit that play button. And don't forget to let us know when/if you ever let others win and why you do/don't to be entered into our newest contest to win valuable prizes. This one is still open and ends 6/14/14. 27:00 - What's in the Box? Hey Jeff and Dave! I really enjoyed the last couple of shows. I do miss the "funny skits, jokes" which used to start off each episode. Any chance of bringing them back? I sometimes let "newbies" win, not exactly... but make movement decisions which are not in my best interest OR point out rules they could (read should) take advantage of. ASL has so many rules.... 'noobs' are at a very real disadvantage when playing a veteran ASLer. Our hobby needs "youngbloods" if it is to survive. You both recently attended ASLOPEN... how many college age or younger in attendance? Last August at WBC the MMP booth had ASLSK1 for $18. When I asked "Thought these were out of print?"... was told they have a "few" which are brought to conventions. I purchased a couple for our gaming group to offer as club prizes at events for newcomers. Later in the month saw Starter Kit 1 on Ebay going for upwards of $70!! Sure fire way of enticing newcomers to ASL, let's gouge 'em good right at the start! Some puddin' heed's already selected the dull option. Give the boys a break! Cheers Jeff and Dave. Your latest episode is not appearing on Itunes.